With the paper products from allbranded, your company can make use of the oldest medium of the world. Print these products with your company logo or slogan and ensure an increase in advertising reach. Whether it is printed bags, waiter notepads or receipt pads you are after, at allbranded you can print everything with a bespoke design. This way, every customer and employee will become a brand ambassador for your company and for other potential customers: Guests in the restaurant or pedestrians are going to notice these awesome products in a heartbeat. Paper products are an inexpensive way to approach large target groups with a high efficiency and be able to win new customers at the same time. As early as 5000 years ago, men such as the Egyptians, Romans or Greeks have transferred messages onto paper scrolls. Paper makes a message permanent and is ,especially today, the basis for important communication. Thanks to its suitability for daily use, the advertising efficiency is immense. Daily life without paper products, such as waiter notebooks, printed laminated bags or receipt blocks, is unimaginable. This kind of necessity makes them brilliant promotional products. Win over new customers and stay in the minds of existing ones. 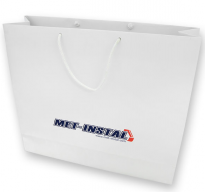 Our paper products are perfect as giveaways, as they draw attention towards themselves, be it the high quality printed bags in the tube, the personalised invoice at a business meeting or the eye-catching waiting notebook at the restaurant. 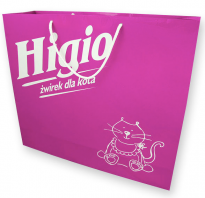 In the allbranded online store you can find a large range of paper products. You can choose between various paper products such as notebooks or printed shopping bags, as well as between different quantities and price ranges. We offer different colours and personalised compilations, so you can address your target group in the most efficient and personal way. Order your personalised paper products at allbranded, to be able to secure effective, extensive, and inexpensive promotional products. Paper products belong to the oldest and thanks to their timelessness, to the most successful promotional products worldwide. As giveaways they distinguish themselves from other products, as they can be produced in big quantities for a low price. They can be given out at trade shows, exhibitions, and events or at the end of a meeting to be used at work or privately. As they are not restricted to any target group, the success of addressing new potential customers is that much bigger. Our paper products can be used in the office, at restaurants, at seminars or even at home. 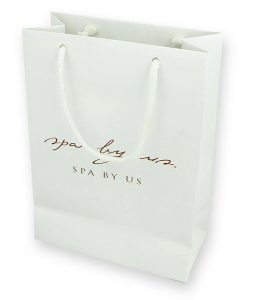 Utilised in the right way, the laminated bag made out of paper, can be used as advertising space when people take a walk. 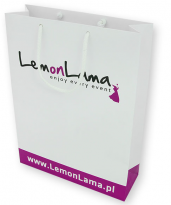 If you are going to print your contact details onto the bag, you can be sure to receive a lot of attention of people, which might have never crossed your way. In terms of design and personalisation, allbranded knows no boundaries. You cannot only choose the colour of your promotional products, but also a unique print, which will go onto your items. Be it your company logo, your contact details or your campaign slogan – allbranded will fulfil every wish. Get a personal consultation from our allbranded team and order your promotional paper products today at the online shop.